You know the saying “April showers bring May flowers?” Yeah, well we’re digging the idea of May flowers, but we’re not so keen on April showers. Still, the idea of braving the elements in these adorable rain boots perfect for spring does have a certain appeal to it! 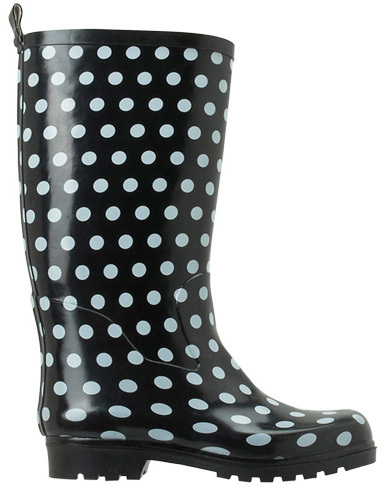 We’re always up for wearing a good polka dot print, and we’re currently crushing on these black and white polka dot rain boots from Payless ($30). Cute, cheap and practical… we like it! Yeah, we’re a sucker for a cute print! 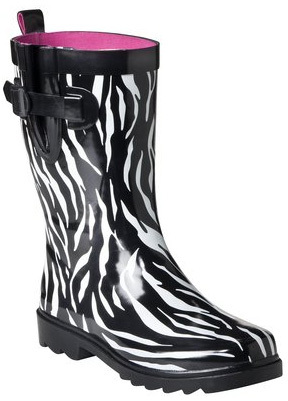 And we love these chic zebra rain boots from Target ($25). You know what we also love? The short length! Sometimes a gal doesn’t feel like being swallowed in a high rain boot, and the length of these little babies seems just perfect to us. Obsessed with pink? So are we! 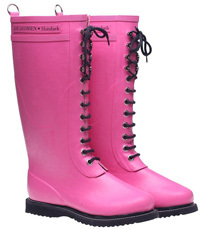 So it’s no surprise that we’re totally smitten with these lace up pink rain boots from Ilse Jacobsen ($199). Pretty in pink, indeed! Who says flat spring rain boots have to have all the fun? These platform ones from Hunter ($195) offer fashion and function and enough versatility that you could even wear them on sunny days. 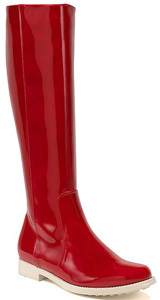 Red never goes out of style, and if you’re looking to make a style statement on a dreary, rainy spring day, these red rain boots from Aquatalia ($298) are your best bet.